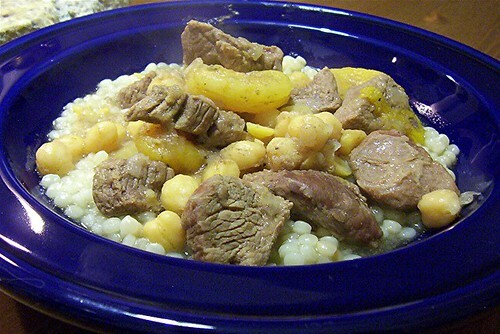 Saturday was another nasty, cold, wet, blustery day – perfect for a stew. We had some lamb in the freezer, already cleaned and cut up for braising, and I felt moved to make a tagine. A few years ago I bought J a copy of Claudia Roden’s book on Middle Eastern food, but we’ve actually made very little progress through it with the exception of two tagine recipes, one with preserved lemon and one with apricots. They’re both excellent, so maybe someday we’ll try something else from the book. Anyway, this time I felt like making the apricot one. I got started shortly after 4:30 pm when we got home from errands, and dinner was ready around 7 – not really a workday dinner for us, but fun for the weekend. The tagine is really straightforward: I began by sauteeing a chopped onion in a glug of olive oil for awhile, until soft but not browned. I added cinnamon, cumin and a bit of cayenne pepper, then added sliced ginger, garlic and the defrosted lamb chunks and salted and peppered them liberally. Once they were browned I added water just to cover, brought it to a simmer and covered the pan. It burbled away on the lowest heat setting for about an hour while I did other things. Then I tossed in about a half pound of whole dried apricots, stirred it up and covered it again. About 20 minutes later I added a can of chickpeas, left the lid off so the liquid could boil down slightly, and started on the couscous. Lebanese couscous is awesome. It looks like aspirin, which is hilarious, but it basically just tastes like pasta and has a great chewy texture, and it soaks up sauce extremely well. I cook it like I would a grain pilaf: I melt some butter in a heavy saucepan, add a little over a cup of couscous and fry it briefly in the butter, then add some salt and about two cups of hot chicken stock. After it starts to bubble I cover it and turn the heat to low, then leave it for 10 or 15 minutes. 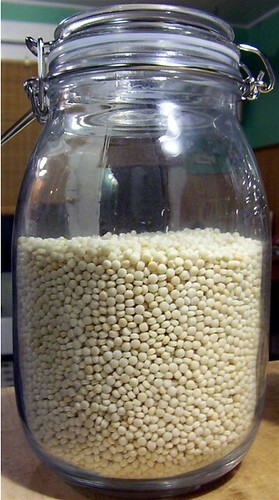 When the lid comes off the couscous has absorbed all the liquid and can be fluffed up with a fork. Tagine is the sort of thing that’s way better the second day, after everything has time to meld and thicken. Leftovers make a great lunch! Still, we never let that stop us from eating most of it right away. We brought out a Bogle Old Vines Zinfandel to go with this – it was bright and fruity enough to pair well with the apricots. Very warming, sweet and a touch spicy, just like the food. 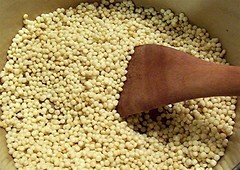 I love Lebanese couscous. I have a hard time finding it, though. I like to put it in chicken soup, like pastina. I think I would like this – it strikes me as a good cold weather dish. I likr the font and ledding here – are you in graphics? I wish I could take credit for the website design, but it’s a WordPress template – they only let us mess with the base template a certain amount. I like it, though. When I started out on Blogger, I was using the same template as you! Very classy.